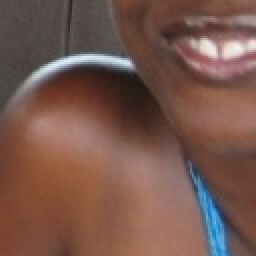 A while back, I went to Peppers Restaurant in Westlands to have dinner with a friend. In the mood for something light, I ordered some crab. The menu listed two crab dishes—one where the crab meat had already been removed from its shell and another where the crab was served whole, still in its shell. I debated long and hard about which of these two dishes to order because the whole crab dish seemed more interesting. I wondered, though, if I knew how to eat crab elegantly enough for a formal dining environment. Not one to be easily dissuaded, despite the waiter’s strong recommendation to order the crab meat dish, I decided to go ahead and order the whole crab. I had eaten crab in its shell many, many years ago as a teenager (and remember it to be an extremely fun and delicious experience) but had never attempted to do so since then. As my friend and I waited for our meal, the waiter began to prepare my setting for the dish I had ordered. First, he brought me two implements which I have since come to find out are known as a cracker and pick. Then, he brought me an apron to protect my clothing. If ever I doubted my choice of meals that night, seeing the apron almost made me change my order. In that moment, I felt there was no way that I was going to manage the crab. Still, bravely I soldiered on and used as much common sense as I could to figure out how to eat crab correctly. All went well. I am proud to say that I had a filling and satisfyingly delicious meal without getting a single piece of crab (or sauce) on my apron. I did however promise myself that I would never attempt that again without adequate preparation. This is what I’ve since learned about how to eat crab with minimum fuss. Apparently, there is no neat way to do this. Eating crab is meant to be a messy affair! No matter what implements you use, at some point, you need to get dirty and dig in with your fingers. Still, there is some science surrounding how to eat crab with ease. 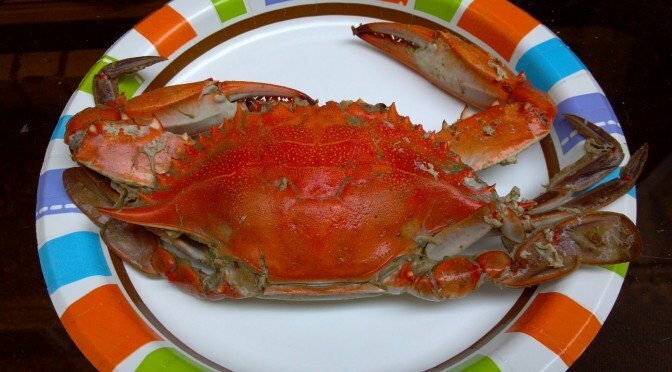 When presented with a whole crab, start by pulling off the legs by gently twisting them at the point where they connect to the body of the crab. Crab legs and claws contain the most meat, so be sure to enjoy those thoroughly. After separating the legs from the body, break each leg into sections with your hands. Crack each of these sections with your hands or a cracker to get to the meat inside. To use the cracker, put the crab leg between the tongs of the cracker and then press down. Once the outside shell is cracked, you can easily remove the meat with your hands or with a pick for the pieces of meat that are hard to reach. After the legs have been eaten, proceed to the body of the crab. Depending on the type of crab, you can either lift the apron of the crab, a flap found on the underside of the crab, with a dull knife and then remove the top shell of the crab with your hands, or else just crack the crab shell in two using a cracker. 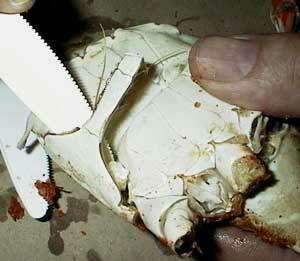 Most of the inside of the crab is edible though you can stick to the white meat if you are squeamish. Either way, once the crab is split into two halves, the meat can easily be gotten to using your hands, a knife, and/or a pick. That’s it. That’s how to eat crab neatly. Do not worry if you feel that you are not getting a lot of meat. The white meat of a crab is normally only about 15 percent of its total weight. This may seem like a lot of work to do for such little meat, but the ritual itself is half the fun. If this whole process is not for you, remember that you can still enjoy crab in dishes where it has already been removed from its shell. I hope you now know how to eat crab correctly, and that this information serves you well when you are one day faced with eating whole crab. Remember it is expected to be messy, so don’t miss out on all the fun for fear of that.